A 34" Modern Reproduction of Jade sculpted by Gwen Ross of Texas. She is exquisitely painted with fine detailed features and beautiful coloring by Master Doll Artisan Stephanie Sowatzka. Stephanie has chosen to do her interpretation as a Native American Dancer attired in a beautiful Jingle dress. Jade has porcelain feet and hands with long elegant, slender fingers. Jade has a porcelain shoulder plate, and head on a cloth body. Jade is also available in a 24" size. 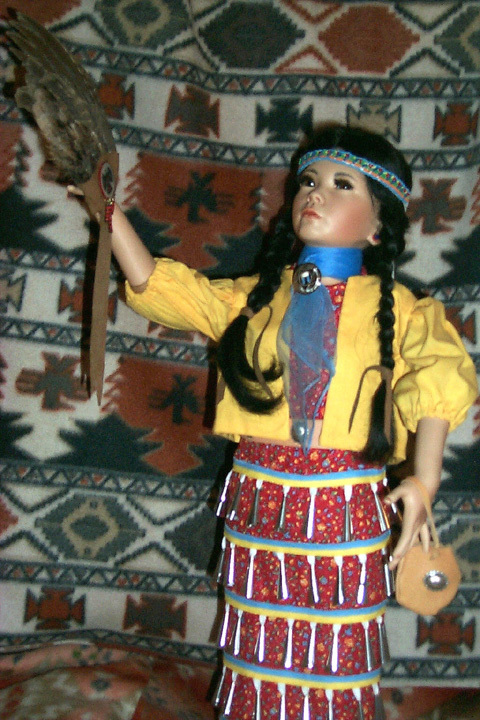 The Native American Jade by Stephanie is limited to 50 dolls, and all are signed and numbered by Stephanie. Since these dolls are made for each individual customer, your suggestions as to clothing, complexion, hairstyle and eye color are welcomed and will be incorporated when possible.